Good evening everybody and welcome to Yarn and Hooks. 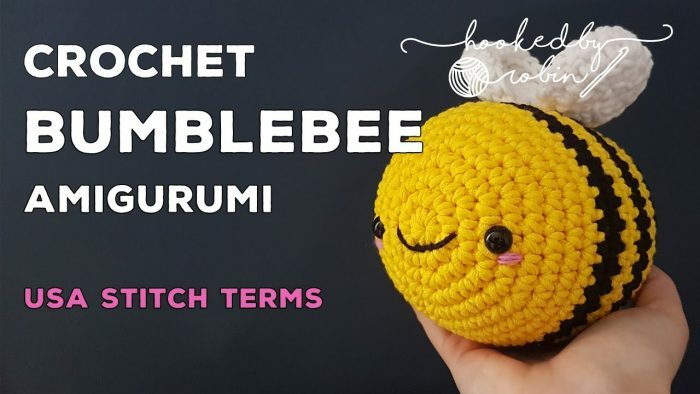 Today I will be teaching you how to crochet chunky and cute amigurumi bumblebee using a free crochet pattern and the step by step video tutorial. I’ve discovered this beautiful pattern a few days ago and as soon as I saw it, I knew it would be a perfect little gift for my nephew. She loves bees so much and I think this is a good example of how amigurumi bee should look like. Despite the fact that the natural color of bees is black and yellow, I’ve decided to make it in red and blue and it appears to be very eye-catching. In this pattern, we are going to use original black and yellow yarns however, you can choose any other color combination you only wish, it would be a cutest ever bumblebee anyway. So, just scroll down to the free crochet pattern and learn how to make this lovely project for yourself and anyone dear to your heart. Good luck and happy crocheting. Crochet along with me to make yourself a fat squishy oversized amigurumi bumblebee – super simple and easy enough for even a beginner to make.